In another case of alleged violation of family and gotra norms, a couple, which recently eloped and got married secretly, has alleged threat to life from their families. The couple met the police today and demanded protection. There is still no clue to the identification of the young couple found hanging in a discarded building at Tohana town in this district, even as the local police has flashed messages to several adjoining districts. A photograph released by the police that was recovered from the place where the bodies of a young couple were found hanging in a discarded house at Tohana in Fatehabad. The Centre has failed to receive any relief from the Punjab and Haryana High Court in IAS officer’s cadre allocation matter. A record number of 18,801 candidates have filed nominations for the panchayat poll in the district. The office of the Chief Minister’s Flying Squad, Faridabad, has initiated an inquiry into the allegations of irregularities in the grant of subsidy meant for farmers. A face-off between brick-kiln owners from Sirsa and those from the neighbouring Mansa district was witnessed today after local manufacturers stopped over 20 tractor-trailers coming to town. The Haryana police has constituted a Special Investigation Team (SIT) under the leadership of ADGP (State Crime Branch) SN Vashisht to inquire into the sensational triple murder in Khokhri village in Jind district. The Haryana Government today ordered transferred 15 IPS and one HPS officer with immediate effect. PR Deo, IG (HAP) Madhuban, has been posted as IG (Administration) vice Sudhir Mohan, who replaces him. Hectic lobbying has begun within the Congress after the authorities fixed July 1 as the date for voting on no-confidence motion against Dabwali municipal chief Simpa Jain and her deputy Harnek Singh. Opposition parties in Haryana have reacted strongly to the hike in the prices of petro products and have demanded its immediate withdrawal. After several days of blistering hot weather, several parts of the district experienced rain late last night, bringing down the temperatures considerably. Haryana Health and Education Minister Geeta Bhukkal today said the trauma centre set up at the Civil Hospital in Ambala City would soon be provided with the required infrastructure. Haryana has been facing acute shortage of buses and many of the routes had been left with no bus service by the state government-run Haryana Roadways. This is mainly due to faulty policies of the authorities concerned that had been trying to push privatisation without realising its fallouts. This was claimed by a spokesperson of the Haryana Roadways Workers’ Joint Action Committee (JAC) that has announced to hold a rally at Rohtak on June 27. The police today recovered bodies of two girls aged around 19 years on the embankment of the Delhi branch of the West Yamuna Canal near Badwasni village. A youth was found dead at his home in Parvatia colony under mysterious circumstances. Sonu (22), who hails from Farmana village in Rohtak but had been staying in Mumbai at the house of his maternal aunt (mother’s sister) for the past some time, fell in love with his cousin Poonam (daughter of his aunt). They eloped some time back and got married. The couple today reached the police station at Julana town in the district and demanded police security, claiming threat to their lives due to strong opposition from their families to this marriage. They told the police they had been residing at a colony here for the past few days but felt highly insecure from their kin, who had been on the lookout for them since they eloped and got married. Police officials later claimed that police protection had been provided to the newly married couple as per their request. The decomposed bodies of the victims have been kept in a freezer in the general hospital at Tohana, where kin of some missing persons have already visited since yesterday. However, none has so far been able to identify the bodies. The police has sent copies of a photograph, recovered from the room where the bodies were found hanging, to neighbouring police stations and has also circulated these for the local people. In the picture, a young man is seen sitting with two children. SP Jagwant Singh Lamba said the district police was in touch with its counterparts in neighbouring districts of Mansa, Bathinda and Patiala in Punjab, Hanumangarh in Rajasthan and Jind, Kaithal, Hisar and Sirsa in Haryana in its endeavour to establish the identity of the victims. The police believes that the victims did not belong to the Tohana area, as no complaint of missing persons had come to their notice. Both victims were wearing readymade clothes and hence any identification from the tailor’s slip was ruled out, said the SHO, Tohana, Madan Lal. Taking up the Union of India’s petition against allocation of Haryana cadre to IAS officer Dheeraj Gupta, Division Bench of Justice MM Kumar and Justice Jitendra Chauhan ruled: “We are of the considered opinion that it would be appropriate and conducive if the dispute is decided by the High Court of the Jammu and Kashmir”. The Union of India had invoked the extraordinary writ jurisdiction of the Punjab and Haryana High Court for challenging order dated September 13, 2007, by the Central Administrative Tribunal’s Jammu and Kashmir circuit at Chandigarh. “The tribunal in the impugned order held he was entitled for allocation to Haryana cadre. His allocation to Jammu and Kashmir was set aside. He has also been held entitled to his original seniority in all-India merit list even after allocation to Haryana because be was wrongly allocated to Jammu and Kashmir cadre”. “We find that this court has no territorial jurisdiction over the subject matter raised in this petition. Accordingly, the writ petitioner is relegated to invoke the jurisdiction of the competent court in accordance with law”. On the final day of filing nominations, as many as 10,637 candidates filed their papers. They included 2,402 for panch, 7,200 for sarpanch, 877 for panchayat samiti and 158 for zila parishad. The election symbols will be allotted on June 28. An 82-year-old woman of Dhansu village named Korde has filed her nomination from Ward 7 of the zila parishad. There were hilarious scenes in the office of the Retruning Officer when she filed her papers. Meanwhile, Mirchpur village, which was rocked by Dalit-Jat violence recently, created a record when 107 villagers filed their nominations on the last day yesterday. On the first day the villagers had expressed their desire to get the poll postponed in view of the recent clash. However, on the second day of filing papers, three Dalit villagers filed nominations. This led to a flood of nominations on the last day with 107 nominations being filed. These included 32 for the post of sarpanch. This is the highest number of aspirants for the post in the district. The post of sarpanch is reserved for women. The Tribune had exposed the horticulture scam prevalent in the district by publishing a news report titled “Ponds get ‘stolen’ in Mewat: Govt officials take blank cheques from farmers to sanction projects” in these columns recently. Following the publication of the report, DSP (CM’s Flying Squad), Faridabad, wrote to the District Horticulture Officer (DHO), Nuh, asking him to furnish the relevant information regarding the matter. The DSP has asked the DHO to tell what amount had been disbursed to farmers as grant/subsidy for organic manure, digging of ponds and mushroom cultivation during the financial year 2009-10. “Furnish complete details about the matter, including the names and addresses of the beneficiary farmers and the amount provided to them,” says the letter. It further maintains that the date of receipt of the farmer’s application and amount granted to him also be furnished, in addition to the details of officers and employees posted at the office of the DHO and the works assigned to them. The DSP has asked the DHO to provide the information sought promptly so that the inquiry can be completed in a timely manner and report submitted to the government. The Tribune report had highlighted how certain government officials, in collusion with contractors, had defrauded the government exchequer as well as local farmers by usurping funds sent by the government for the promotion of horticulture in the Mewat area. An investigation into the matter revealed that a substantial portion of these funds, meant for the betterment of the farmers, were actually siphoned off by “corrupt” government officials and contractors. Due to this, most of the projects have failed to serve the desired purpose or benefit the farmers. The affected farmers and their sympathisers have expressed gratitude to The Tribune for highlighting their plight. However, the farmers have also pointed out that the investigators had sought the official record of the district office of the Horticulture Department for the past one year only, which was not enough. The farmers have demanded that to let the complete picture emerge, the official record of the past at least three years be looked into. Brick-kiln owners from Mansa reached here with their supporters and alleged that the local manufacturers had thrashed their drivers. The police had a tough time stopping both sides from slogan shouting. However, a clash between the two sides was averted, but the tractor trolleys from Punjab were stranded outside the city as the local manufacturers refused to allow them in. Ram Babu, a representative of the brick-kiln owners from Punjab, alleged that the local manufacturers had stopped them from selling their product in the town. “People purchase our bricks because of the quality of our product. We supply bricks of standard dimensions baked in coal. The local manufacturers supply bricks baked in wheat stubble, which is poorer in quality,” he claimed. Bhim Jhunthra, president of the district unit of the Brick-kiln Owners’ Association, however, alleged that the manufacturers from Punjab had been supplying bricks without paying any tax to the Haryana government. “We pay one-time sales tax on our bricks, but by selling their products in our area, the manufacturers from Punjab have not only been harming our business interests, but they have also been duping the government by evading tax,” Jhunthra maintained. He said the Punjab manufacturers were also violating traffic rules by overloading their vehicles. Jhunthra also alleged that the matter has been brought to the notice of the authorities, but no action was being taken. Deputy Commissioner CG Rajini Kaanthan said the authorities concerned have been directed to check whether there was any violation of the norms by the Punjab manufacturers. Penalty would be imposed in case any violation of the rules was found, he said. A woman, Mukesh Kumari, and her nieces, Seema and Tannu, were lynched to death while they were sleeping in their house on May 9. After the local police failed to nab the culprits, DGP Ranjiv Singh Dalal today constituted the SIT, which has started the investigation. The Jind police had detained seven suspects and polygraph test was conducted on them. The police also interrogated 60 other persons and details of their phone calls have been forwarded to experts for analysis. It is hopeful that Gaurav, son of Mukesh Kumari and lone survivor of the crime, may be helpful in the investigations. On promotion as IG, Balbir Singh has been posted as IGP (RTC) Bhondsi; MS Malik as IG (State Vigilance Bureau); and Rajbir Singh Deswal as IG (CID). Raghbir Singh, DIG (HAP), has been posted as DIG (PTC) Sunaria, Rohtak. On promotion as DIG, Navdeep Singh Virk has been posted as DIG (Crime); Shrikant Jadhav as DIG (HPA) Madhuban; Anil Kumar as Joint Commissioner of Police, Faridabad, against a vacant post; Kuldeep Singh Siag as DIG (Provisioning); Suman Manjri as DIG (HAP) Madhuban; Sat Parkash Ranga as DIG (HAP) Madhuban; and Paramjit Singh Ahlawat as DIG (Crime). Bharti Arora has been posted as DCP (Traffic) at Gurgaon; Ambala SP (SVB) Hemant Kalson has been transferred as SP (Commando), Newal, Karnal; and Randhir Singh, HPS, who was Additional SP (State Vigilance Bureau), has been posted as Commandant (3rd Battalion), HAP, Hisar. With the fear of losing the two key posts to the opposition INLD, efforts are on to find an amicable solution to the tiff between Jain and four Congress councillors opposed to her. The Congress enjoys the support of 10 councillors in the House of 19, while the INLD has nine, besides Ajay Singh Chautala, who is the local MLA. The party has the option of MP Ashok Tanwar’s vote. Led by Ajay Singh, nine INLD and four Congress councillors opposed to Jain had given a memorandum to the DC requesting him to call a meeting of the committee for voting on no-confidence. The DC had fixed a meeting for June 16 but no proceedings could be held as SDM Munish Nagpal, who was to conduct the proceedings of the meeting, did not turn up. The INLD had taken strong exception to the manner in which the meeting was shelved and now the district authorities have issued July 1 as the fresh date for the meeting. The pro-Jain group has intensified efforts to save the chairs of the two functionaries as they know that once the no-confidence motion succeed, the INLD may try to establish its hold over the municipal body. The Congress municipal councillors opposing Jain said they had no plan to support the INLD in case they were able to remove Jain and Harnek Singh. Meanwhile, Jain and Congress leaders supporting her met Chief Minister Bhupinder Singh Hooda yesterday. Simpa’s husband Rajender Jain said Hooda had assured that he would depute a senior leader to bring about a truce. In a joint statement, INLD president Om Prakash Chautala and chief of its Haryana unit Ashok Arora said the increase in the petroleum prices would hit the common man hard and would further add to inflation. They said instead of increasing the prices, the government should have reduced the excise duty and other taxes on the petroleum products to help oil companies. President of the Haryana BJP Krishan Pal Gurjar described the decision to hike the petroleum prices as a betrayal with the common man on the part of the Congress. He said if the decision was not withdrawn immediately, his party would launch an agitation against the government. Gurjar said the increase in the prices of diesel would hit the farmers hard as they were busy transplanting paddy these days and urgently required diesel to replenish the food bowl of the country. The Haryana CPM has also criticised the hike. The rain, which continued for over two hours, was preceded by a severe dust storm which uprooted trees at several places. The minimum temperature in Hisar dropped to 31.5°C as a result of the rain. During daytime yesterday, the maximum temperature hovered around 42°C. Though the rain has given welcome relief from hot weather, the increased humidity is proving bothersome for the people. Addressing mediapersons, she said there was an acute shortage of specialist doctors in the trauma centre. She said specialists doctors would soon be recruited in the trauma centre. She said the government was striving hard to improve the quality of the health infrastructure, ensure availability of quality doctors and efficient delivery of health and medical services. She said construction work on two medical colleges at Khanpur Kalan in Sonepat district and Nalhar in Mewat district had already been started under the economic stimulus package at a cost of Rs 617 crore. Bhukkal said JBT and BEd teachers would now be recruited in the state only after passing the teachers’ eligibility test. The government was aware of the problem of shortage of teachers and efforts were being made to sort out the issue. JAC leader Dharambir Hooda claimed that the state government was going to privatise the public transport in the state by issuing 2,700 permits to private bus operators. Claiming that there was a strong resentment over this move, he said several panchayats had already passed resolutions against it. To build pressure on the government to abandon the plan, the JAC would organise a state-level rally at Chhotu Ram Stadium in Rohtak on June 27. The union demanded additional 8,000 buses to the state roadways fleet and regularisation of services of ad hoc workers. Their bodies had been kept in mortuary of the civil hospital here for identification and a case has been registered under Sections 302 and 201 of the IPC against unidentified persons. The girls appear to be of Nepali origin. According to information, the bodies were noticed by the some villagers around 4 am on the road between the Delhi branch and new parallel carrier channel. After receiving information, SP KK Rao, DSP RS Yadav and SHO sadar police station reached the spot and after preliminary investigation the bodies were brought to the local civil hospital. It is suspected that the victims were strangulated somewhere else and their bodies dumped near the canal at night. Gaurav (20) was found dead with charpoy turned over his body. 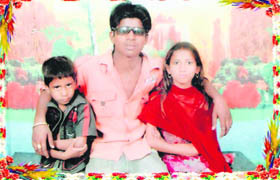 He was alone at home as his father, Surender Joshi, had gone to Ajmer to bring other members of the family. When he came home on Friday, he found his son dead. It seemed Gaurav was strangulated. The police has registered a case. However, the cause of death was not clear. According to the police, direction of the investigation would be decided only after postmortem examination was conducted.